When it comes to bowling movies, it’s hard to beat The Big Lebowski! We especially love the opening credits scene as it’s essentially a love letter to bowling alleys. It perfectly sets the tone for the rest of the film as the camera lovingly showcases the wooden lanes, pin-deck, and ball return we’re all so familiar with. See what we mean below. Men in Black 3 offers a more slapstick bowling scene. When an alien interrogation goes nowhere, Will Smith’s character breaks out some impressive (and ridiculous) bowling skills. Check out Agent J’s skills for yourself. Curb Your Enthusiasm is full of awkward comedy, and when Larry goes to the bowling alley things are of course no different. An embarrassing shoe mixup is compounded in a way that only Curb Your Enthusiasm could pull off. (Don’t worry, your shoes are safe at Mid County Lanes!) Watch the embarrassing and bizarrely entertaining exchange for yourself. Did your favorite bowling movie, TV episode, or scene make our list? Share your favorite with us below in the comments! And when you’re ready to stop watching other people have all the fun, plan your next bowling trip to Mid County Lanes. Check out our hours and upcoming events now! With Middletown schools back in session, it can be hard to make time for quality family bonding for you and your kids. Thankfully, bowling makes for the perfect after-school activity for the whole family! 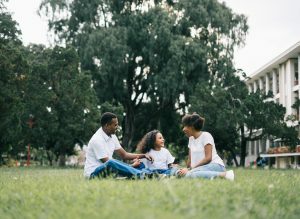 The ACPeds agrees that spending quality time with your kids is important for their development. Research shows that children who spend more time with their parents tend to behave better in school and are less likely to get into trouble. Spending time together also helps children and their parents relieve stress and can lead to healthier living. And of course, it increases family bonds! Not only is family bonding good for mental health, but it can also be great for your family’s physical health too! Bowling, in particular, can help tone and strengthen lower body muscles and arm muscles. It also lowers the risk of heart disease, can aid in weight loss, and improve hand-eye coordination! 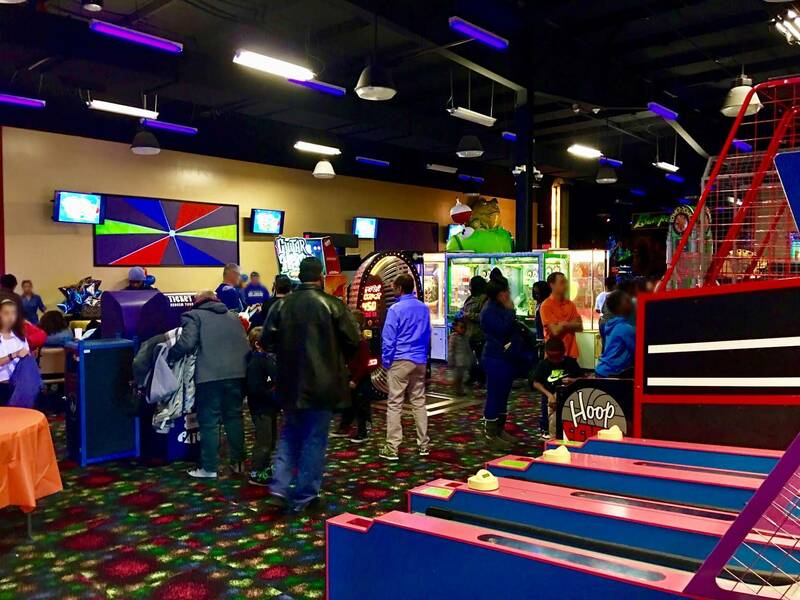 Our Middletown bowling center has something for the whole family! We have bumpers and ramps for the little ones and no age limit for bowlers. While you’re here, you can also check out our Family Fun Galaxy! 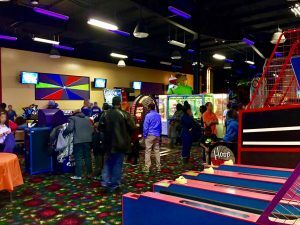 Our fun center has laser tag, bumper cars, mini bowling, dozens of arcade games, and of course, our Frog Hopper free fall! We also have a snack bar in case you or the kids need a little after-school or after-work snack. So next time you’re looking for a fun after-school activity in Middletown, stop by Mid County Lanes to spend some quality time with the whole family! 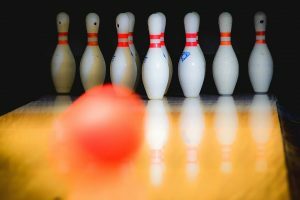 Mid County Lanes Presents: A Brief History of Bowling! The sound is the first thing that hits you when you walk into a bowling alley. 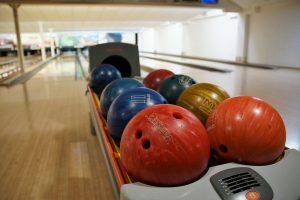 It doesn’t matter if you’re at Mid County Lanes in Middletown, DE, or an alley across the country, the sound of a bowling alley is one of a kind. But what comes to mind when you hear the clash of bowling balls into pins? For us, we think back to the origins and the evolution of bowling. A lot of people attribute the beginning of modern bowling going back to the Germans in the 4th century. Others say it was actually the English around the same time. However, anthropologists have found crude bowling balls and pins in the tombs of Egyptian children, meaning bowling could be as much as 5,000 years old. And yet, bowling is such a perfect game that after all this time, the general principles have changed very little! Pretty cool, huh? It wasn’t until the late 19th century that we started to see a standardized set of rules develop across the United States. But once the rules were set, the way was paved for the start of league bowling! Bowling clubs started popping up across the country and by the turn of the century, we started to see women’s leagues pop up, too. Bowling has continued to grow decade after decade. In 1988, more than 20 countries competed against each other as bowling was presented on the world stage at the Olympics as a demonstration. Now looking forward to 2020, bowling may get another crack at becoming a summer Olympic sport. No matter how competitive it gets, though, the essence of bowling is pure and simple fun. At Mid County Lanes, we always have a lane or two for you and your friends and family. 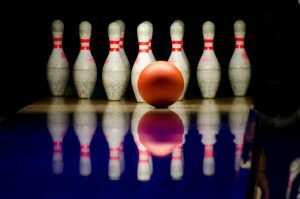 Stop by and roll a few frames today and soak up the history and fun that comes with every game of bowling. At Mid County Lanes in Middletown, DE, we think having the right bowling ball can make all the difference. Check out some of our tips and stop by our pro shop to step up your game today! The biggest difference between owning a bowling ball and using a house ball is the way a custom ball fits your hand. In fact, with custom finger holes drilled to specifically fit your hand, you might even want to add a pound or two to your usual house ball weight. House balls never fit perfectly and therefore, they are harder to grip. When you have a ball drilled for your hand, you’ll never even notice that extra weight. There are a couple of materials you can choose from for your own bowling ball. Polyester is great for entry-level bowlers who aren’t throwing a huge hook. These balls are usually priced under $100. Or you can step up to a performance ball which is made out of reactive resin. These balls will allow you to put some wild spin on your roll without losing any control. Now that you’ve picked out the material and weight of your ball, it’s time to get your finger holes drilled to fit your hand just right. Our pro shop will get you measured and discuss the most comfortable grip for your bowling ability and style. Add finger grips will allow you to add a little extra spin too. Talk to our pros about your options today! Bowling is a ton of fun. It’s competitive, it pushes us as individuals and as teammates to do better and reach further. And it’s great for the entire family to enjoy. If you’re like us here at Mid County Lanes in Middletown, DE, you probably can’t get enough time at the lanes either! Well, you’re in luck because our fall bowling leagues are open for sign-ups! Bring your whole team down and get ready to find an open spot on an existing team. Either way, you’ll have a chance to step up your game this fall in a fun league for all skill levels. At Mid County, we’re proud to offer a bunch of different leagues to fit anyone’s preference or ability level. Check out the quick snapshot of our fall schedule below then give us a call to find out what to do next! Maybe it’s been a while or maybe you’ve always liked bowling but haven’t spent that much time doing it. Our leagues don’t start for another month and we always have an open lane for you. Swing by and check us out, get some practice frames in, and start gearing up for your league play at our pro shop! We’re happy to give you some tips to get you to the next level too. And we know that leagues can get a little competitive, but most of all, we want to make sure that everyone has a great time! That means we’re always here to help maximize your experience at Mid County Lanes any way we can. Swing by today and sign up for your four-person team! Join Us for Bright Pin Cosmic Bowling This Summer! 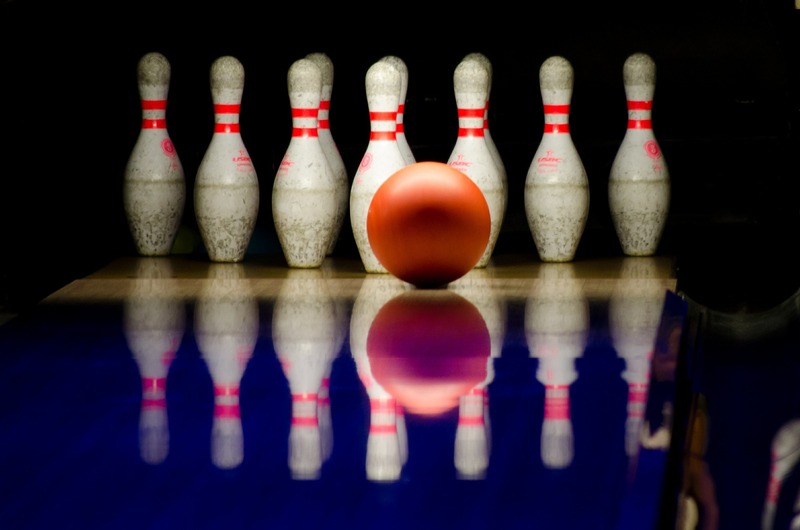 The team at Mid County Lanes wants to liven up your summer with some cosmic bowling! We’re offering a great deal on cosmic bowling Thursdays through Sundays. On Thursdays, we are hosting cosmic bowling from 7 pm to 10 pm. The price is $15/hour and you can have five bowlers per lane. On Fridays and Saturdays, you can enjoy cosmic bowling from 8 pm to midnight. The price is $25/hour and you can have five bowlers per lane. Of course, you’ll need to rent shoes if you don’t have your own bowling shoes. But, we’ve made it extremely affordable: only $3.75/person for shoe rental! An awesome time for an affordable price isn’t the only awesome part of this cosmic bowling deal. When you throw a strike with a bright-colored pin as the head pin, you’ll win a chance to spin the prize wheel! What are you waiting for? 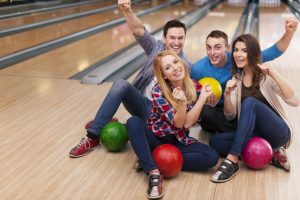 Grab your favorite friends or family members and head to Mid County Lanes for fun, cosmic bowling. Contact us today if you have any questions! Summer is finally here! And, after a long school year, your kids need this well-deserved break. Fortunately, summer is an awesome season to make memories with your kids and have a great time as a family. 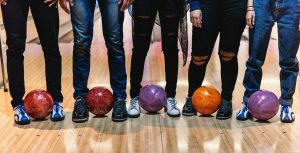 That’s why the team at Mid County Lanes put together a list of activities that we’re positive you and your family will enjoy. As for number six, we know the perfect place to go bowling: Mid County Lanes! 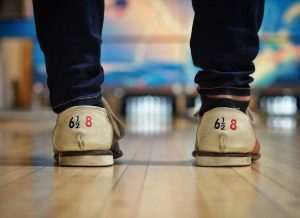 All these ideas are great, but we’re especially partial to bowling because of all its amazing benefits. When you take your family bowling, you will make new memories, have a great time, eat delicious snacks, and maybe even find a new hobby! Are you ready to head to the bowling alley? Check out our summer hours here. We’re excited to see you soon! You know that a trip to the lanes is fun, but did you know it’s also good for you? There are tons of benefits to going bowling. Social Benefits. Whether you want to make new friends, connect with old friends or family, or just have some time to yourself, bowling is a great way to do it. Joining a league at Mid County Lanes will introduce you to new people from all walks of life. Cognitive Benefits. Did you know that learning a new skill is good for your brain? It’s true! There’s evidence that learning new things can keep your brain sharp and even help prevent the onset of dementia. Physical Benefits. Bowling isn’t quite as much of a workout as kickboxing, for instance, but it sure beats binge-watching TV on the couch. Some time at the lanes does get you up and moving, using muscles you may not use regularly, and helps to improve your flexibility and balance. Plus, Mid County Lanes is fully air-conditioned, so there’s no need to sweat in the summer heat. Emotional Benefits. Playing games while listening to music is undeniably good for your mood. So is mild exercise! Endorphins released by having fun and moving around will help manage stress, and everybody wants that. Plus, nothing beat the sense of accomplishment from practicing and getting better at a new skill. Whether you’re joining a league or just coming out for open bowling, we can’t wait to see you at Mid County Lanes. Getting your own bowling ball isn’t just a fun step for a serious bowler–it’s also a big investment. Learn how to properly care for your bowling ball with these maintenance tips from Mid County Lanes. Wipe your ball down after each shot. You’ve probably noticed the oil track after you roll your ball, so hold the ball in one hand and use a microfiber towel to do a quick once-over. While it may seem like a chore to do this every time, trust us! This first step is so important to increasing the longevity of your bowling ball. Before you pack your ball away at the end of your game, give it a more thorough cleaning. A few spritzes of ball cleaner will help remove debris, oil buildup, and dirt. With proper care and maintenance, your bowling ball will last you a long time! If you have questions, don’t hesitate to talk to the staff at Mid County Lanes.